According to permits filed with the state, construction is set to begin shortly on the Guardians of the Galaxy roller coaster at Epcot. There are actually two documents of note here. One is a notice of commencement filed with a contractor named as Adena Corporation. Adena is the same company that installed both of the attractions in Toy Story Land. While they don’t actually manufacture the parts, they are responsible for the installation. With an expiration date of less than 1 year from today, it’s likely that installation will begin sooner rather than later. 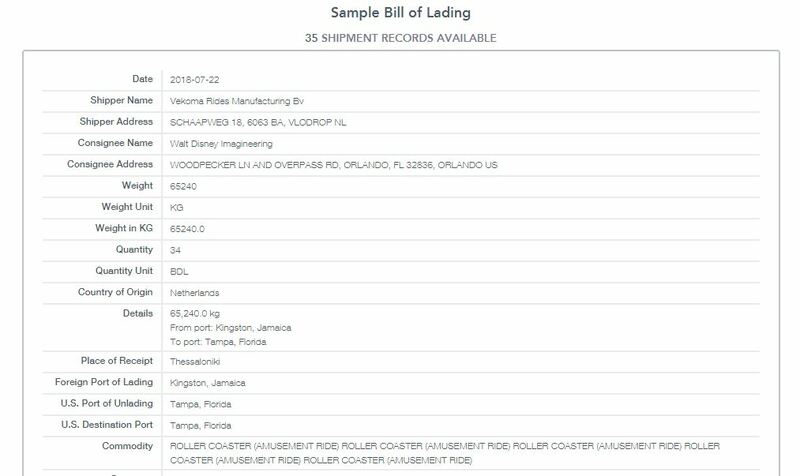 Speaking of the parts, the second document of interest is a Bill of Lading from Vekoma Rides Manufacturing – the company thought to be behind the new roller coaster. The document shows that 143,000lbs of roller coaster commodity is on its way to the Port of Tampa with a final destination at Woodpecker Lane and Overpass Road, the backstage entrance to Epcot. The company listed to receive the shipment is Walt Disney Imagineering and a second address on the document points to the Imagineering building behind the Universe of Energy pavilion. With both of those supporting documents, and the fact that construction is already moving along at an impressive pace, we anticipate that the installation of the Guardians of the Galaxy roller coaster is set to begin soon at Epcot.